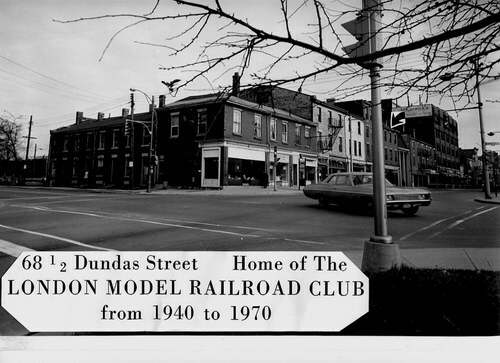 The London Model Railroad Group was formed in 1938 with four members, the Group had its first club room near downtown London at #68½ Dundas St. near Ridout St.
Photo of the club circa 1940 located where the arrow points to. 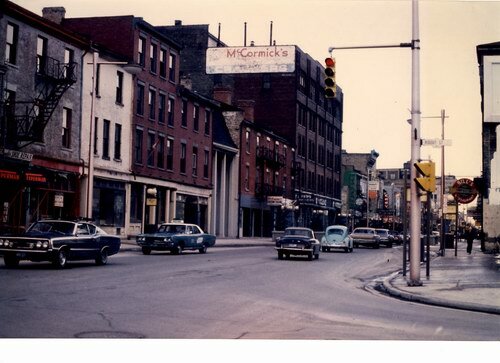 Photo of the club circa 1970 Just before the big move. In 1970, after fire damage and urban renewal removed the first building, the club move to its current location at 69 Holborn Avenue. The layout room is 32 by 12 meters and contains three types of "O" Scale railway models, Standard Gauge or Main line, Trolley, and Narrow Gauge. The Trolley and Narrow Gauge sections of the layout are under going major destruction and reconstruction and the town of Vicsburg no longer exists in order to make way for a larger Narrow Gauge section. The layout is meant to represent a fictitious railroad that runs through Canada - along the northern shore of Lake Erie from New York State to Michigan and is called the Lake Erie & International (LE&I). There are approximately 5000 feet of standard gauge track on the layout, all of which has been hand laid on home made wooden ties with four spikes in each tie. Twelve hundred feet of the track is main line and makes five loops around the building. All of the switches and other track work are also hand made by club members. The minimum curve radius is 6 feet (1.98m) and the maximum grade is three percent. A train traveling at a scale speed of 50 miles per hour will take 12 minutes to travel the full length of the main line. Four main line trains can be moved around the layout at once by the cab operators located in an elevated tower along the south wall of the building. Electrical power to the trains is supplied by a plug and jack system. As the train moves along the track from the telephone type plugs are moved from jack to jack through which power is supplied to the blocks. There are a total of 45 main line track blocks and many more in yard areas. There are 3 circus train sections on the layout. These are models of actual cars from the days when large circuses traveled from town to town via the railroads. There are more than 30 cars in these three trains. There are twenty-one stations and yards on the layout each of which has its own unique characteristics and switching problems for the operators to deal with. The stations have passenger, freight and industrial areas that the station operator may use to break up trains and make up new ones. There are also branch lines that connect to the main line. All of the stations are connected by a telephone system that was wired by club members. Along the north wall of the building is a hidden storage yard that can hold 10 trains so that a greater number of different trains can be used with a minimum of switching. At Holborn yard along the north side of the layout is a coaling tower, a 16 stall roundhouse and turntable. There are 3 lift bridges at the front of the layout that have been built by past and present members. All are driven by electric motors and are remotely operated by the train dispatcher located in a separate room. The Lake Erie Electric (LEE) Trolley line is in the west end and centre of the layout. The trolley's are all powered from the wire above the track just as are the real ones. Trolley's used from Vicsburg to Georgetown and back again through an automatic reverse loop system. The trolley also runs to the Shawville station to pick up passengers from the mainline railroad. The trolley is currently under a construction and will be rebuilt to run from Georgetown passenger station to Shawville passenger station in a continuous loop with the entire LEE yards in Georgetown to be replaced by a residential urban industrial scene yet to be finalised. In the former town of Vicsburg there was a model based on the incline railway that operated at Port Stanley, Ontario. The incline carried guests from the trolley to the vacation resort area at the top of the hill. No definite plans have been made to relocate the incline railway to another part of the layout. The narrow gauge railroad (formerly called Lakeside and Pine Valley) is located in the south east corner of the building. It serves mining and logging areas and interchanges with the standard gauge railroad at Lakeside. The narrow gauge is On3 which means that the distance between the rails is thirty six inches (91.4cm). These narrow gauge railways were very often used in mountainous areas. The majority of cars and engines belong to the individual members some belong to the club and are a variety of kit and scratch built, made from brass wood and plastic. Many of the steam engines are hand built by past and present members. The cars and equipment range from the early days of steam to the present day. The buildings on the layout are almost all made from scratch and belong to the club. They do not follow any particular prototype except for the passenger station and freight station at the Shawville yard, these are models of the Canadian Pacific Railroad station on Richmond St. in London. There is also a model of the club house building at Shawville. The scenery is also made from many materials. The rocky areas are hydrocal with a plaster on a chicken wire base. The mountain areas at the west end of the building are constructed from garden bark chips that have been glued together and painted. In the south west corner of the room will be a logging and mining area served by the narrow gauge railroad.